by Darren J. Smith, P.E., NETZSCH, Inc. 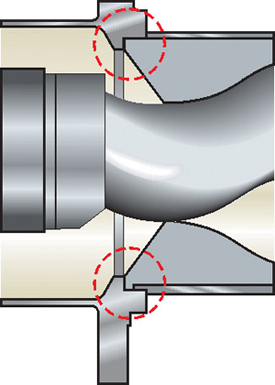 Since the introduction of progressive cavity (PC) pumps (see Figure 1) many years ago, stator maintenance has been a concern of plant operators and maintenance personnel. When do I change the stator to maintain optimum pump efficiency? How do I justify the cost of a new stator versus operating speed, efficiency or performance of the old stator? Do I have the best stator material for the application? To answer a few of these questions, here are some helpful tips on stator applications and selections. When choosing a pump for your application, make sure your pump supplier has all the applicable information necessary to make an educated decision. The pump service information, environmental conditions, cleaning solutions, operating conditions and maintenance cycles are all important to make the proper pump selection. The number one issue with stator selection is stator material (chemical compatibility). You can select the most cost effective material and still maintain proper pump performance, but this often requires chemical testing of elastomers prior to the pump's purchase. Consider cost, wear resistance, chemical resistance and availability for replacement parts. In some cases, the best elastomer is not a commonly stocked material, which could lead to availability problems later. Check your options before making that final decision. Consider not only the pumped material in chemical compatibility, but also the cleaning chemicals (acids, bases, soaps, solvents) and other chemicals that may come in contact with the pump stator (flushing the pump with oil, air, steam, hot water). The temperature of the product and cleaning chemicals should also be considered when deciding which material to choose. Consider the number of stages to choose. The commonly available sizes from most PC pump companies are single stage (90-psi), double stage (180-psi), four stage (360-psi) and eight stage (720-psi rated). 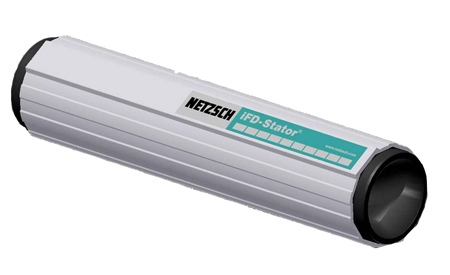 In general, PC pumps are rated at 90-psi per stage, which is the maximum the pump should be designed to handle. Efficiency can be calculated, and the pump manufacturer can provide required horsepower (HP). Remember that a two-stage pump is more capital cost when compared to a one-stage, and replacement costs are higher too. When considering how many stages to use, remember HP, replacement cost and operating cost (efficiency). Another important consideration with progressive cavity pump stators is the geometry profile (see Figure 2). 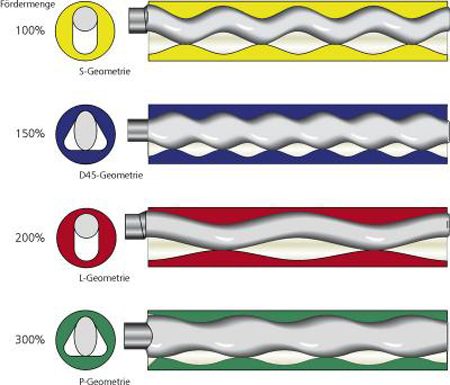 Generally, there are four different stator geometry technologies in the marketplace. Conventional geometry is typically 1:2 (single helix rotor inside a double helix stator). New stator configurations include 2:3 (double helix rotor inside a triple helix stator) geometries. Also, consider standard (short pitch) or long geometry when choosing a stator. Standard geometry is usually best for thick material because it has a larger opening to the stator cavity. Long geometry is an efficient design because of its long sealing line. Various 2:3 geometries are cost effective since they pump more flow per revolution compared with standard designs. The tube material can also be an issue when selecting stator types. Steel tubes are the most common, but in some cases stainless steel tubes (more expensive) are required (food service, chemical service, sanitary reasons). Sometimes aluminum housings are used (light weight and cost effective). Be careful to consider what cleaning chemicals would be used on the outside (washdown service) of the pump. Some new designs incorporate a separate stator insert (rubber material) with the stator tube (see Figure 3). This new design makes replacement of future stators easier and cost effective, and incorporates the ability to recycle the two components without complicated mechanical separation. Stator gaskets should also be considered when making a stator choice. Some stators require O-rings to seal, others require gasket material and others have molded-to-fit stators that have integral stator gaskets (see Figure 4), made from the same stator material, as part of the stator itself. This eliminates extra parts and simplifies the changing of the stator.